Congratulations to our very own Dr. Jennifer Jansma and her teammate Carol Lewando. They won the 1st place prize in the 2016 Crystal Gallery of Ice competition. Their oceanic themed entry, The Pearl depicts an underwater scene with vertical coral elements and a large clam with a round ice pearl inside. 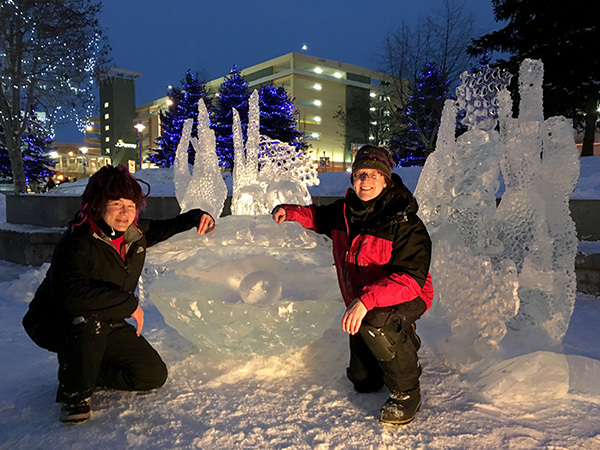 The 2016 Crystal Gallery of Ice competition is an annual event organized by the Anchorage Downtown Partnership, Ltd. and is hosted in Town Square, in the heart of downtown Anchorage. Ice carvers from all over the state (and world!) competed in this ice carving competition, transforming ice slabs into beautiful works of art. photo credit: 2016 Crystal Gallery of Ice Presented by Anchorage Downtown Partnership, Ltd.